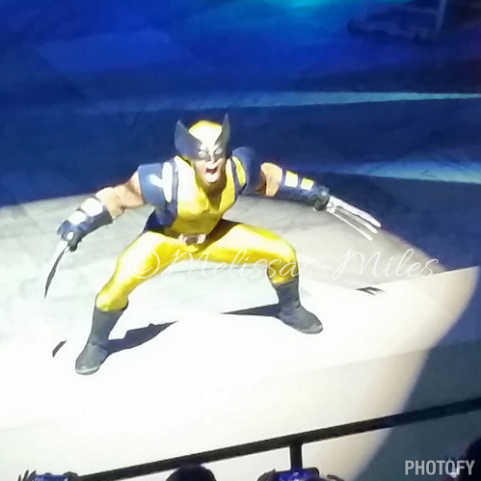 Marvel Universe Live: What a night! What a night, from explosions, bangs, lights and action. 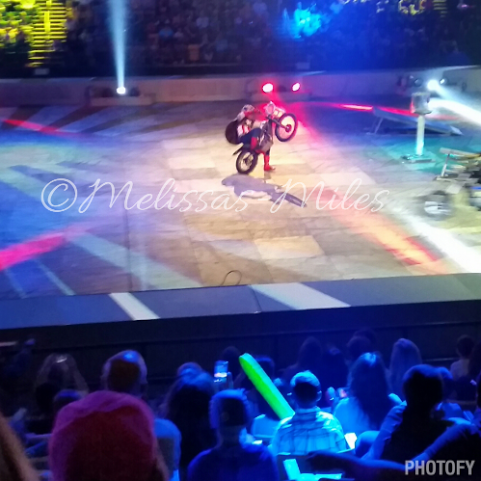 The racing motorbikes, the cars and fights all taking us by surprise with each stunt. 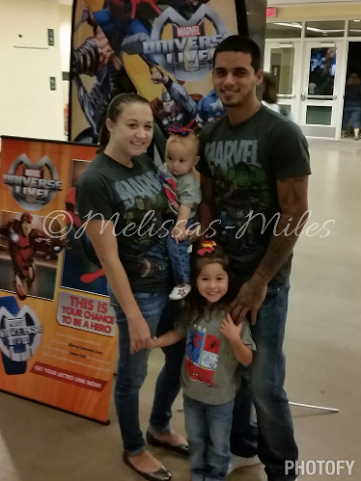 My family and I enjoying Marvel Universe Live. We began our night with muffling the ears of our little ones as the explosions echoed through the Patriot Center in Fairfax Virginia we were unaware of what was to come. Our hearts set on seeing out favorite superheroes from Spiderman, Iron Man, Thor and Wolverine to the incredible Hulk, Storm, Captain America and Captain Marvel… Our eyes widened with each bang, lights streaming around the stage to the large televisions that made such an impact upon the story line. 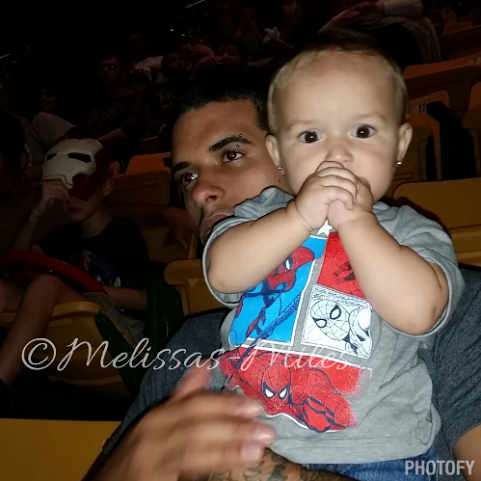 Elleanna is entranced into the show, along with daddy. I watched as my daughters were entranced into the storyline, Elleanna’s head kept turning back to the screen, to the superheroes unwilling to take her eyes off them for a moment. It was the first time clapping her hands (at nine and a half months and for Geraldo and I to see.) and shaking her head back and forth smiling. Her enthusiasm for the children superheroes around her, for the lights and sounds amongst the never-ending movement of the show lit my heart in ways I cannot explain. As I turn my head to see Isabella I watch as her eyes jumped around the stage from one action shot to the next, transported into another world. It was as if we were no longer were in Virginia but amongst the superheroes in New York or in the snowy mountain tops; bouncing around the world with Wolverine, Captain America and Thor. As intermission came the tense ear muffling became no more, the show began once more and I found Isabella not on my lap nor Gerlado’s but sitting like a big girl in her own chair. She was watching intensively as her superheroes battled head on with some of the most famous rogues. Pyro stunts capturing our eyes for children and adults alike, we were all in astonishment. Waiting for the moment the Hulk would make his entrance, a moment that brought the crowd to an uproar. The intense battle for the pieces of the Cosmic Cube was so captivating, as our eyes shot from one superhero battle to the next I found myself cheering for the superhero’s and biting my tongue when I would get worried about them losing. But truth is when do superheroes ever lose? 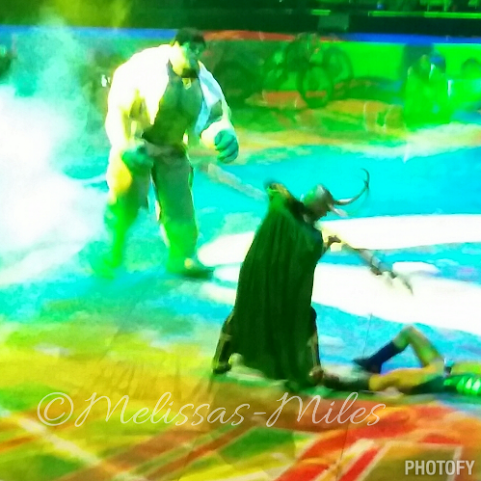 Marvel Universe Live brought to life the superheroes and their opponents that I read in comics as children. The Green Goblin and Doc-Oct sending goose bumps up the back of my neck as if they were right next to me. I must say the facial features were spellbinding, as if I was staring at the pages of the comic book again; reading their lines and hoping that Spiderman would defeat and save the city once again. There are plenty of chances for you to see your favorite superhero or rogue at the Patriot Center in Fairfax Virginia. I certainly can say that Marvel Universe has given my family and I an experience we have never had before. Who knew after the beginning of the show with ear muffling that Isabella would be asking to see it again rather than going home! One experience I hope that adults and children alike are able to take part in. Ticket Information: All seats are reserved. Tickets can be purchased at all Ticketmaster outlets, by phone at 800-745-3000, via www.ticketmaster.com, and at the Verizon Center and Patriot Center box offices. All Ticket prices start at $35.00. Ticket pricing is subject to change based on market demand. Next Post Teething Bling: She has her Bling do you?